If Bradley Cooper's take on Guardians of the Galaxy's psychopathic raccoon doesn't sell you on Marvel's next big comic book movie, then wait until you hear Vin Diesel utter his first "I am Groot." Whether or not this tale of Marvel's team of intergalactic "heroes" captures the imagination of the general public is moot at this point. Everything a fan of the comic books could possibly want is in here, and should this be the only Guardians movie made, we'll always have Rocket adjusting himself. 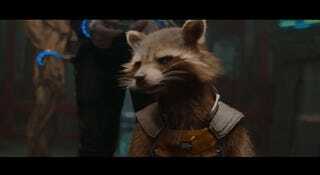 And a special bonus GIF, for my fellow Rocket Raccoon fans.